Okay, the headline’s a little bit creepy, just like the film with a similar title. But it got your attention right? And actually, it’s not too far from the truth. 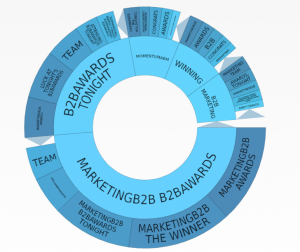 However, before I tell you what I know about your activities during the B2B Marketing Awards on November 23rd, let’s get another reason for this post out of the way; we won ‘Best use of customer insight’ at the same event. On the surface, it might not seem like one of the more glamourous categories – rather than rewarding content marketing, social media, branding or any of the other elements that can contribute to a rock star B2B campaign, this award focused on insight. There is huge variety in the way B2B marketers are setting up and running immensely successful campaigns, which proves there is more than one way to skin a cat. I’ll explain what I mean here. I’d imagine all those companies from the esteemed winners’ list will have clients asking them, ‘What makes a successful campaign?’ If they won ‘Best use of content’, they might say ‘content’. If they won ‘Best use of creative’, they might say ‘creative’ etc. However, when you look at all the case studies, it’s glaringly obvious to me that no one discipline was successful, it was the integration of them that made them stand out. While there are many ways to run great programs, I genuinely think you need a strong foundation of customer insight to deliver real success. Insight can help you understand the pain points of your audience, the questions they’re asking, even the terminology they use. This got me thinking, we used lots of customer data to fuel our award entry, why don’t I try and do the same for the awards themselves and see what people were talking about on the night? That way I could find out what you got up to at the B2B Marketing Awards, and thus help deliver on a creepy headline which has persuaded you to read to this point (i.e. past the point where I get to plug Pulse’s award win a couple of times – or make that three now). What was the topic of social conversation from the awards night? Could they tell me what some of the companies at the awards really care about? What content are they looking at in general? What do those same people talk about usually? Unsurprisingly, the conversation on the night revolved around winning, congratulations and some competitive agencies who shall not be named (but are below, well done Momentum J). There wasn’t huge traffic either side of the awards, but as you’d expect there was a small spike when nominations and awards were announced. Winning best use of content marketing is always a big category (well done Earnest) and it seems that’s what everyone talks about – from how you build a strategy for it, to how you action it from social media to SEO? When you look at the subset though, you can see people know they need content but are unsure how to link it to the execution and distribution vehicles. Without knowledge of your audience you are always going to struggle to do this. If you know what your audience are talking about on the different channels (e.g. social, web, search) then content creation can be data led, and when you push said content out there, guess what? It works. So, one of the reasons (I think) that we won our award was use of company level insights, especially as it was (that dirty term) account-based. What’s interesting here is that content marketing also comes up, so not only are people tweeting about it but they’re actively reading content about it. 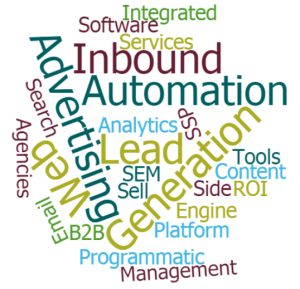 More unsurprisingly these companies are keen to understand integrated marketing and lead generation. Whether you’re selecting accounts, creating content, understanding the right distribution channels or aligning sales, this data is vital. 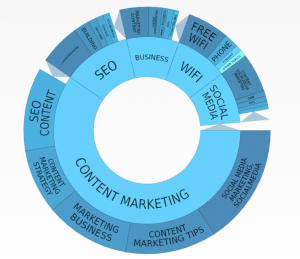 With this particular example, we can see account level subject matter insights and persona level subject matter insights across the web and social. Pretty powerful stuff right? Now I’m not saying we’ve used this insight for our own marketing (we actually have) but what a good way to know who to target and where? So when I said I know what you did at B2B marketing, I was half telling the truth. Read the full case study for a best example of using customer insight in b2b marketing.